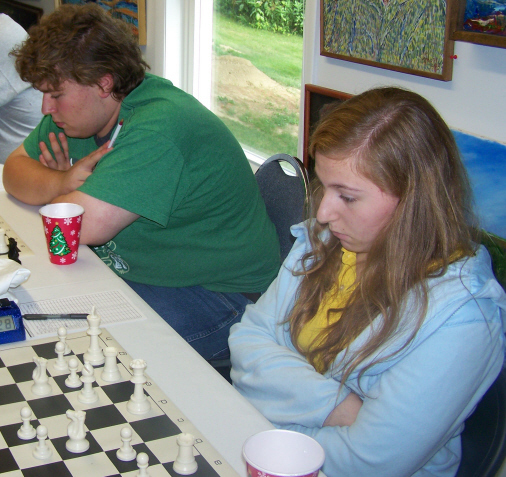 08.21.10 Eight players competed in the 4th Annual Houlton Open played on August 7th at the Roger Morin Art Studio in Houlton, Maine. Morin took top honors scoring 3.5 points in four rounds. Roger Morin and Ray Haines each having scored 2.5 points in the first three rounds set the stage for a dramatic last round showdown to determine the winner of the 4th Houlton Open. Morin, the favorite by a mere 94 USCF rating points, was able to score the full point giving him 3.5 points and an unassailable lock on first place. Haines finished tied for second with Richard Fontinha and Katherine Abderhalden with 2.5 points. Lance Beloungie and and Richard Abderhalden each scored 2.0 points, Glen Snyder scored 1.0 point and Roger Hardison rounded out the crosstable scoreless. This event was organized and directed by Roger and Lois Morin. To visit the Roger Morin Art Gallery please click here. 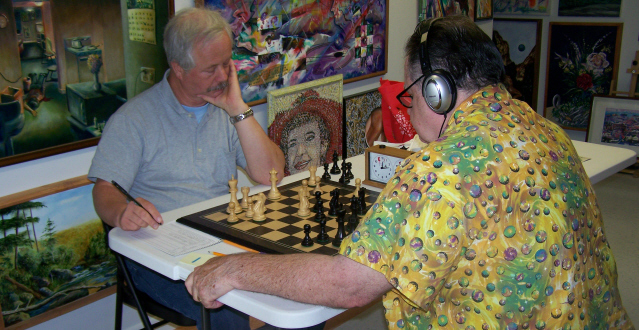 Ray Haines (left) doing his best to hold off Roger Morin in the last round. 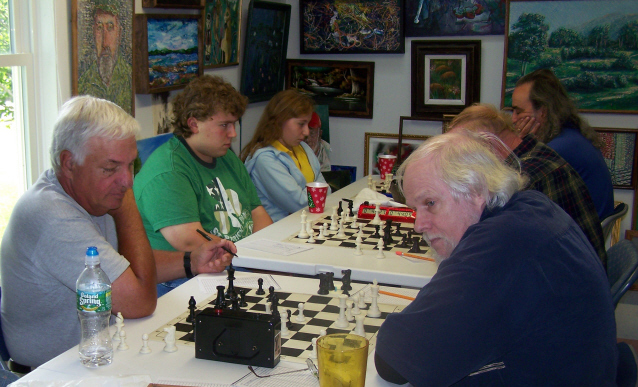 Roger Hardison (foreground left) plays Lance Beloungie while Richard Abderhalden (middle left) plays Glen Snyder and Katherine Abderhalden (background left) plays Richard Fontinha in the final round.